The wild lands are growing restless. The king has called upon all able-bodied men to push back the creeping edges of the map. As the leader of a fledgling adventurer's guild, you are tasked with gathering resources, forging weapons and slaying epic monsters of the wilderness to earn riches and prestige with the king. 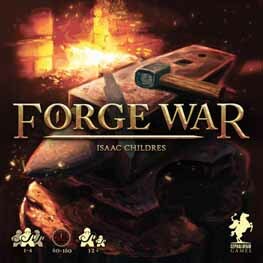 Forge War is a competitive game of economic management and spatial reasoning n a high fantasy theme. Players must undertake quests set forth by the king to slay fierce foes like goblins, assassins and a mighty red dragon. But weapons and adventurers don't come easily! Players must successfully navigate the kingdom's mines to gather metals and precious gems, then head to the market to get their hands on weapon designs so they can forge their own implements of victory! Forge War is a complex game full of player interaction and meaningful decisions. The core game can be played in about an hour, though players can also have the option of playing a longer 3-stage game for a full epic experience. A "Fast-forward" pack that unlocks 2 new intermediate modes of play through card drafting. A set of bonus tiles that increases the need for smart play and forward-thinking.